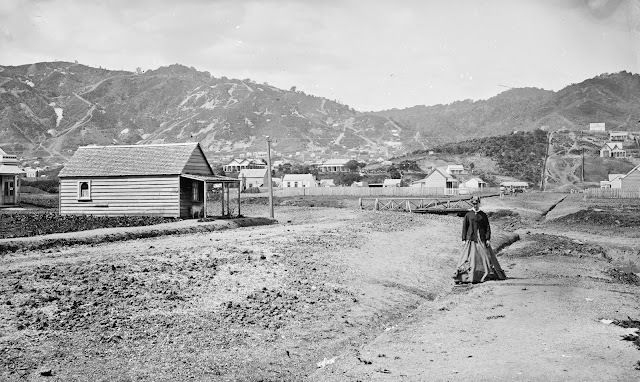 The town of Shortland was ready for a good party by the time the 31 December 1867 rolled around. The miners, their families and associated businesses had already had their ups and downs. For many mostly downs! First was the drinking on New Year's Eve. There were ten hotels open and it was estimated in the Daily Southern Cross 6 January 1868, that there were 500 men at each establishment. First footing took place and the proceedings wound up without any noted problems, the men no doubt eager to save something for the sporting events to follow over the following days. The sports were held on the flat ground near the Hape Creek, with Mr Mackay's grand new house looking proudly down upon those gathered. ABOVE: This view looking east along Grey Street is later 1868-69, but shows the flat area where the sports were held. James Mackay's residence is on the hill (two gables) centre left. The building in the foreground is the Shortland Town Post Office at the corner of Grey and Mackay Streets. The Hape Creek and one of the many pedestrian bridges is in the centre. 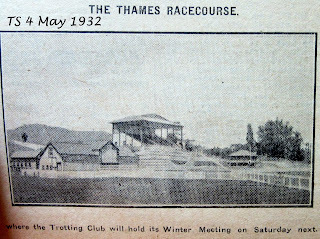 Refreshment stands, temporary grandstands and marquees lined the sporting ground, ready to quench the thirsts and feed those attending. Extra ships brought extra spectators and competitors to the town. An interesting note made by the correspondent was that the Europeans were making an effort to prove to the 'natives' that they were friendly. One must not and should forget the impact that mining had on the tribal groups who were well established and content before the goldfield was flung open! Just five months previously this was Maori owned land, now in occupation of thousands of Europeans out to make money. The sports started at 11 o'clock 1 January 1868. A 100 yard and 350 year running race started the day. The local Maori also took part and the latter race was won by Nikorima who was far too strong for his opposition. A full report appears in the Daily Southern Cross 6 January 1868, snippets are below. There was a damp start to the second day of events, but eventually some did take place. These included throwing the Hammer competition and hack races. The stewards had to deal with some heated dispute over the running of several of these heats. The third day of events, 3 January 1868, was also affected by the weather. Those entered in the boat races faced a difficult breeze blowing from the south-west. After further events, Taipari gathered the natives present and they performed war dances and songs for the Europeans gathered. The exchange of cultures and activities appeared to have been the star of the days events. Two groups finding their way with one another and appreciating what each group had to offer. Anyway, the day ended with Landlord Mulligan being carried back to his hotel by the local Maori, as an expression of thanks for the gracious way he accepted them and their customs. Joseph Mulligan was associated with several hotels at the Thames, the first was the Victoria Hotel, Pollen Street just north of the Grey Street intersect. 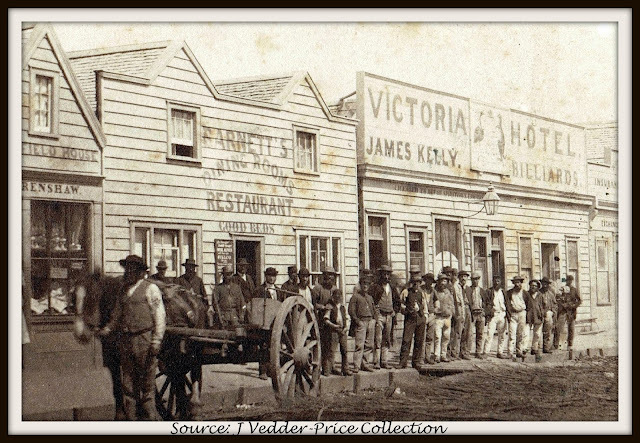 ABOVE: 1870s view of the Victoria Hotel, Pollen Street, Shortland Town. Day Four, Saturday 4 January 1868, and the events just kept on happening! The 100 yard foot race was rerun and won again by Foster. Followed by miscellaneous events and horse races. The highland bagpipes sung out and delighted all those who were gathered. The day coming to a close with a great speech by Landlord Joseph Mulligan. Mulligan was well received by the crowd given that he had offered to share a hogshead of beer with his friends gathered before him! Plus he pledged money to hold a further event on St Patrick's Day next! So ended the first New Year on the Thames Goldfield. As the town continues to celebrate 150 years since the goldfield opened, it is 150 years since those first horse races were held on Shortland Flat. The Thames Jockey Club will on 4 January 2018 celebrate 150 years of horse racing at The Thames, with a race meeting at the Parawai Racecourse. 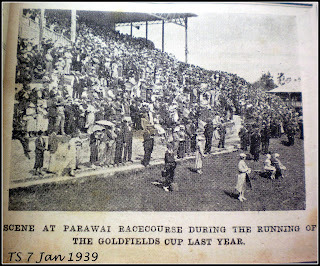 ABOVE: 1930s views of the Parawai Racecourse, Thames.